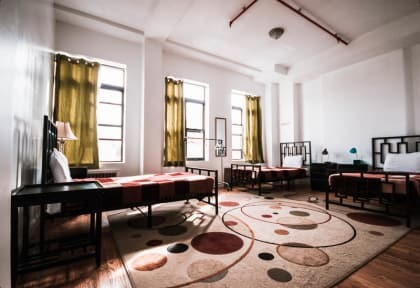 The NY Moore Hostel is conveniently located in East Williamsburg, an increasingly trendy and up-and-coming Brooklyn neighborhood with easy access to Manhattan. Our vibrant surroundings are bursting with fun bars, music venues, galleries, cafes, restaurants, and shops. The hostel itself is a fully-renovated loft with a bright and colorful atmosphere. Many of our walls are adorned with street art and murals from artists from all over the world. Our rooms are comfortable and spacious and private bathrooms. Guests can relax and use the FREE Wi-Fi in our cushy common room or have a beer out in the Courtyard. Come see for yourself and rest easy with New York Moore Hostel! Guests may cancel their reservation free of charge up to 48 hours before arrival. Changes or cancellations within 48 hours of the arrival date will incur a late cancellation fee equal to the full rate (including taxes) of the first night of the reservation. No-shows will incur the same penalty. NY Moore Hostel has exceptional mixed and female dorms with private bathrooms in every room. The varieties of 3-bed dorm rooms are each uniquely different large loft style with high ceilings and lots of sunlight. We also offer private rooms with private bathrooms for a more relaxing and enjoyable experience. These chambers include full or queen sized beds, lamps, and storage for clothing. The highly recommended Bedford Ave is a 5 minute subway ride from us; this is arguably Brooklyn's most artistic community. Experience the hipster lifestyle which boasts street art murals by local artists, and even summer block parties! Please note New York legalization does not allow to host the same person more than 20 days per year. INCREDIBLE hostel -- amazing neighborhood (some of the best food and street art in the world), super spacious, luxuriously comfortable with couches everywhere, super friendly and helpful staff, unlimited tea/coffee, full kitchen, lockers and room keys, game room and TV room (with Netflix) and computer room and hangout spots, great courtyard for smoking. Near metro stations to get wherever you need. I've been all over North America and this is the best hostel I've seen so far! Good vibes all day. The staff at this hostel made an otherwise ordinary hostel experience be the greatest one ever!! My shouts out to you guys. You’re the best!! One of the greatest value for a hostel. Super clean and spacious rooms with high ceiling, so unlike smaller hostels, dorms are still fresh and still smell good after a bunch of dudes spend the night in the same room. + free coffee. On the map, a little remote from Manhattan but the L train brings you there fast. Safe area. The staff were great. It's close to the subway, which made getting into Manhattan easy. Clean. Would definitely stay again. Clean, convenient, good value, kind staff! I checked in late at night. Walking around the neighbor as a single female is a little bit scary but not too bad. My room smell a little bit but not sure it is because of the people i am staying with or the issue with cleaning. My bed is a twin bed instead of a bunk bed and i have a bed side table so it is a plus. Staff is friendly but as i only stay for a night so can't comment on too much. Overall a nice value for my money as i only book my accommodation less than a week before my arrival. This hostel is in Brooklyn, so a little off from the main sights in Manhattan, but on the other hand closer to JFK Airport. The neighbourhood did not always feel safe at night which is a negative point. The rooms are large and spacious, especially for New York standards with single beds (not bunk beds).